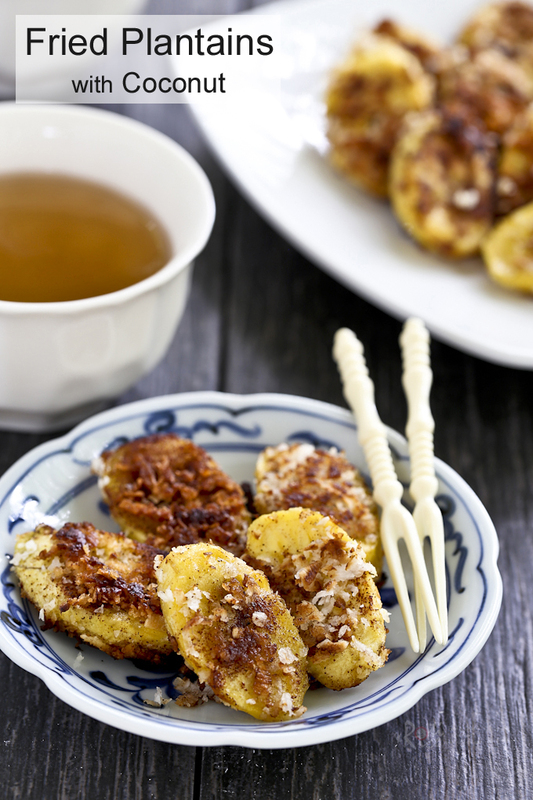 Quick and easy Fried Plantains with Coconut using only 4 ingredients. Takes under 20 minutes and is perfect for afternoon snack or tea time. Plantains are not something I buy often. I recently saw some at the grocery store and purchase a couple to update my Bubur Cha Cha post. Life got busy and I never made that dessert. The plantains were getting rather ripe and so I made these Fried Plantains with Coconut instead. It was so tasty I actually made it twice. I had to run back to the store for more plantains. Good thing they still had some nice ones left. Plantains look very much like a regular banana. They can be a little larger and tend to be more angular. Plantains are less sweet and more starchy. While they can be eaten when ripe, they taste better fried or boiled. 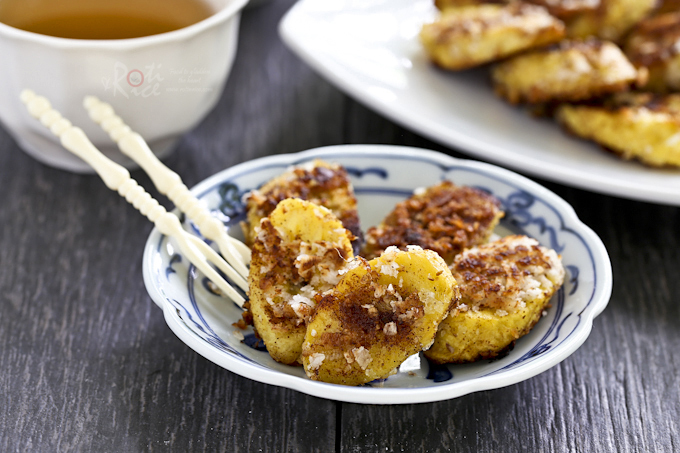 You can say they are a kind of cooking banana as they remain more or less intact when cooked. Bananas on the other hand turn soft and juicy when cooked. The plantains here are simply known as plantains. In Malaysia and Singapore, the kind of plantain you would find there is Pisang Tanduk which are often used in sweet soups like Bubur Cha Cha. Sometimes they are also made into plantain chips, more commonly known as “banana chips”. Fried plantains are not new. They are cooked in many parts of South America, the Caribbean, Africa, and also Southeast Asia where plantains grow. Typically, the plantains are simply peeled, sliced, and pan or deep fried. Sometimes they are coated in batter and cooked like Pisang Goreng. As mentioned earlier, plantains are also popularly added to a coconut milk based dessert in many parts of Southeast Asia. I decided not to coat today’s Fried Plantains with Coconut in a batter. Instead, I used shredded coconut to give it a little more flavor and a slightly crunchy texture. It was really fragrant while frying in the pan. The more ripe the plantains, the sweeter they tend to be and so no sugar was necessary. Do give it a try. Peel plantains and cut diagonally into ½ inch thick slices. Place on a plate in a single layer. 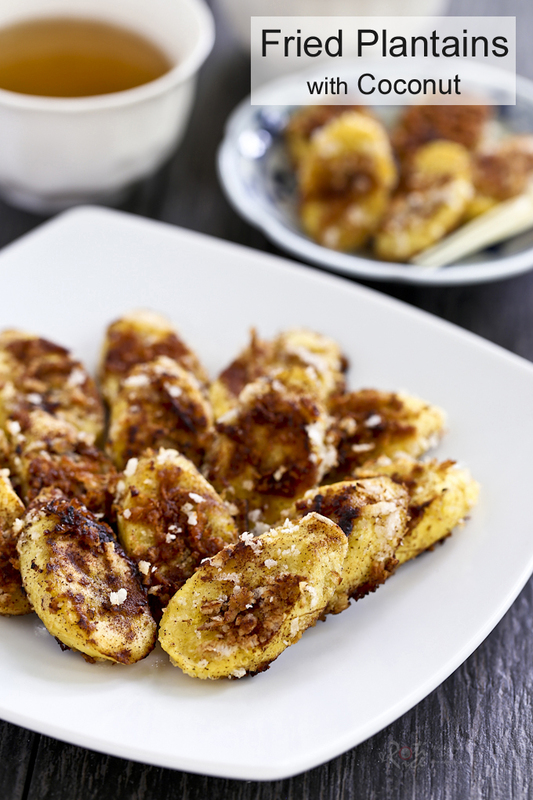 Sprinkle sliced plantain with half of the ground cinnamon and shredded coconut. Gently pat and press coconut into plantains. Heat 1 teaspoon coconut oil in a large non-stick fry pan over medium heat. Transfer plantains to the pan in a single layer with the ground cinnamon and coconut side down. Sprinkle remaining ground cinnamon and shredded coconut onto plantains. After about 3 to 4 minutes, flip plantains in the pan. Add remaining coconut oil and continue to pan fry until plantains are cooked through and caramelized. This is something that I am going to try. I love the addition of cinnamon. Looks delicious, mouth watering! I tried frying plantains once and they turned out too mushy and sweet. I think they were too ripe. Did you use green plantains for this? It looks perfect and I love the addition of the coconut. Thanks MJ! These plantains were ripe but firm. Their peel had some brown spots. The plantains in my first batch were more ripe with more brown spots. I actually like them better as they were sweeter. They still held their shape when fried and were not mushy at all. 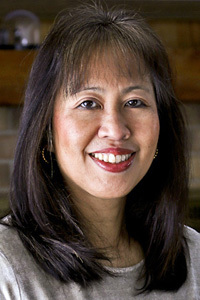 Thanks Linda! Hope you’re having a wonderful weekend!